The impact of "Scarface" on popular culture - for better or worse - is undeniable. During a press conference in North Miami Beach in July where the arrests of 53 violent gang members were announced, the chief of police held up a Scarface movie poster he said officers found in the home of one gang member. In 2006, then Miami Heat player Shaquille O’Neal, celebrated his 34th birthday with a Scarface-themed party. Just a few blocks from where the chainsaw scene on Ocean Drive was filmed, tourists can find all manner of Scarface memorabilia at souvenir stores. Not bad for a movie that was reviled in some quarters in Miami even before a frame of film was shot. Miami: A Retirees’ Paradise or a Cocaine Smugglers’ Hideaway? The hotels’ elderly occupants would escape the stifling summer heat of their cramped rooms by spending much of the day sitting on the hotels’ shaded porches in lawn chairs chatting with each other. As the sun went down the streets were surrendered to petty criminals, junkies and newly arrived Mariel refugees. 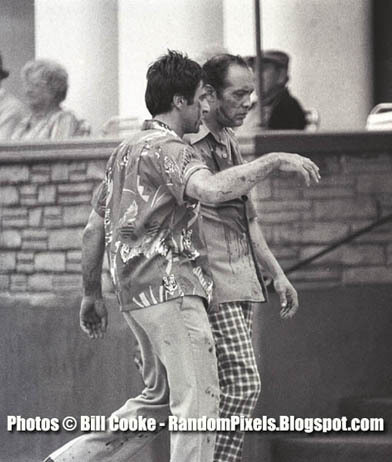 However on a Saturday in April of 1983 Director Brian DePalma chose a one-block stretch of Ocean Drive between 7th and 8th Streets to film one of the more violent scenes of Scarface, his campy re-make of the 1930’s gangster classic starring Al Pacino as a Cuban refugee who becomes a big time drug dealer in Miami. 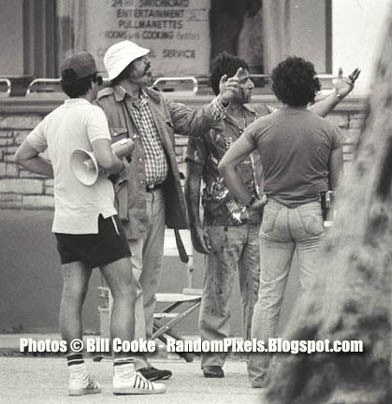 DePalma had planned to film the entire movie in South Florida, however the opposition and threats of violence egged-on by then Miami city commissioner Demetrio Perez forced DePalma to move most of the film to Los Angeles. 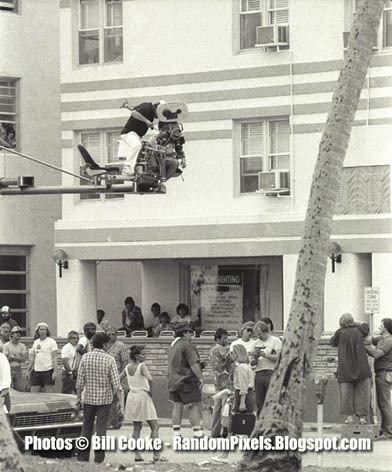 Only a few exterior scenes would be shot in Miami. I was an amateur photographer in 1983. My dreams of becoming a photojournalist not yet realized, I was working at a condominium on Collins Avenue. On this particular Saturday a co-worker who relieved me told me of the activity taking place on Ocean Drive. I always kept my cameras in my car and after leaving work I headed straight for the action. When I arrived the street was closed off to traffic. Actors, technicians, production assistants hurried about as extras and passersby on sidewalks gawked hoping for a glimpse of the main actors. Cameras and props were readied and electricians laid heavy cables along the already cramped sidewalks. I found a grassy spot filled with spectators across the street from the Beacon Hotel where filming was to take place. And over the next few hours I shot roll after roll of Tri-X black and white film with my Nikon FM2 as Al Pacino -armed with an automatic pistol - ran through take after take of chasing another actor into the street from an alley between the Beacon and what is now Johnny Rocket’s restaurant and the Irene Marie modeling agency. Pacino then shoots the other actor and makes his escape with his pals in a battered old 1960’s Chevy. I stuck around, not knowing the best was yet to come. As the late afternoon light began to fade, grips placed a dummy dressed like the actor Pacino had been shooting at in the middle of the street. DePalma paced about looking for the best angles and conferring with Pacino. Then all was ready. 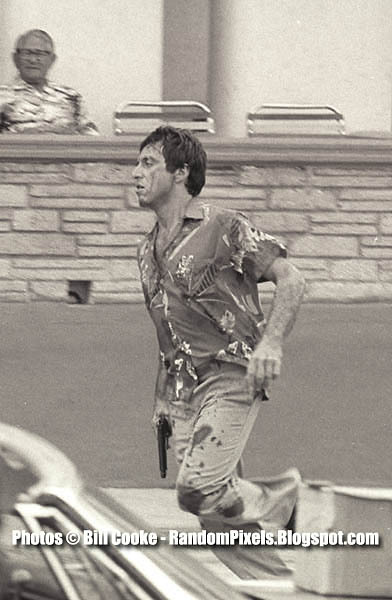 Pacino once again aimed his pistol - this time at the dummy - a technician fiddled with a switch on a box which was connected by wires to the back of the dummy’s head. DePalma yelled “ACTION!” Pacino took aim at the dummy. The technician flicked the switch and the back of the dummy’s head blew off. I pressed the shutter button of my Nikon’s motor drive and captured the whole scene as the dummy’s scalp flew through the air. 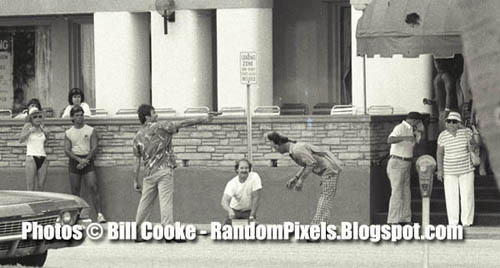 Other photographers in Miami had been trying for these photos. But I had them and I saw no other photographers around! Earlier in the day I had been talking to a photo editor at the Miami Herald. I called him again and he told me to bring my film in. The paper was planning a story for Sunday’s paper and Herald photographers didn’t get any pictures. The Herald processed my film and the editor picked several frames to print. I was ecstatic! My dream of being a published photographer was about to be realized. The next day I looked through the Sunday Herald. There was the story on the filming on page B-1 but no photos! I called the paper to find out what had happened. The photo editor called me from home and explained that they had planned to run a photo with the story but an editor had killed the photo. It seems that Sunday was the third anniversary of the start of Mariel boatlift. The editor feared a photo would arouse the ire of the Cuban readership. One of my photos was eventually published in the Miami News and a day or two later I got a call from the Associated Press. They wanted to buy my photos. I had a foot in the door! Over the next few months I convinced the AP photo editor to let me take on a few assignments. Through much of 80’s and 90’s I was lucky enough to cover many major stories here in South Florida. More than a quarter-century later I’m still shooting and Scarface has become a cult classic with many young fans. But one question continues to nag me: why do so many embrace this film like no other - especially those fans who weren’t even born when the movie was made? But perhaps New Jersey blogger Kris Seals has the answer. Last month he wrote, “America is a ‘Scarface’ society, meaning that if you die and are evil, it is considered just peachy as long as people like you and you make a lot of money. 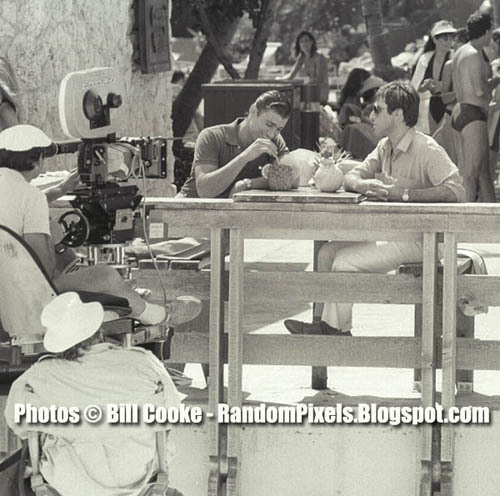 "The Making of Scarface and the “Lost” Images"
Thank you Bill for taking these fantastic pictures! It must have been great to be a part of movie history even though at the time no one could have imagined its relevance in the 21st century. Do you have other pictures that you are willing to share from the movie? Thank you for posting and sharing! What is the hotel that Tony Montana goes into the Ocean Drive, please? It wasn’t a hotel, it was an apartment house ar 728 Cean Drive. Can you publish the complete set of your photos on your blog site? I would like to see some of this because Universal has been stingy releasing anything behind the scenes concerning Scarface. Hi Chris, we’ll pass your question on to Bill. He recently had a gallery showing of some of his photography. Perhaps he has a few more “Scarface” photos to share. What do you mean by “Universal has been stingy releasing anything behind the scenes concerning Scarface?” Can tell us why you want to see Bill’s full set? Chris - I shot these photos and what you see here are the the best of of approximately 100 images I shot over two days of filming in 1983. I am in the process of possibly mounting an exhibition of the photos I shot but probably won’t be posting any more online. Like Gus, I’m not sure what you mean by Universal being “stingy” about releasing anything from behind the scenes. I’m sure their production still photographer took many behind the scenes photos. Why they aren’t releasing them might be a matter you might want to take up wit them. Bill, have you considered making posters of your “Scarface” photographs and selling them to collectors? People love “Scarface” memorabilia and I your photos are totally original. I would gladly pay $125 for one of your prints. 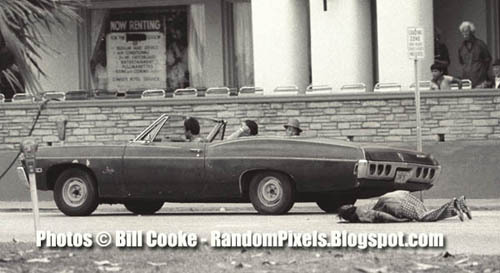 Bill’s photo’s are a true documentary of what took place. He was not hired or told what to shoot or what not to shoot. I was always curious being a film student myself how some scenes where shot and his work is unfiltered. What is the woman in the apartments’ name? 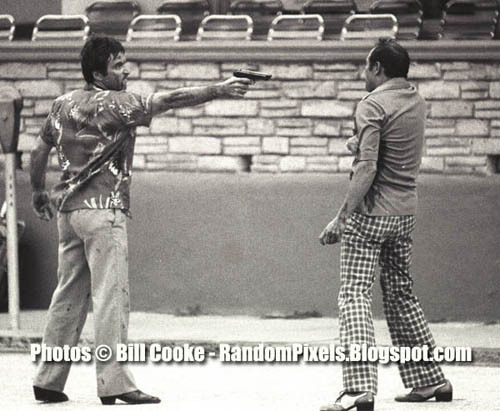 I have a couple of pictures of Al Pacino, taken during the making of scarface in Florida. If any one is interested in seeing them or a copy e-mail. Family was in Florida on vacation and were able to take these pictures. That was when no one thought this movie was going to make it big. The womens name was Martha. We would love to see the picture. I will send you an email. There is a book “Scarface Nation” that delves much deeper into the production with recent interviews with cast and crew. There is a book “Scarface Nation” by Ken Tucker that delves much deeper into the production with recent interviews with cast and crew.